Yesterday I began a series called The Case for the Resurrection Eggs. This series loosely introduces the Minimal Facts about the resurrection of Jesus to young children. We start using these eggs on Easter Sunday, so you still have time to make them. The eggs are simple to make – I got most of the egg innards from our lego and playmobil collections. 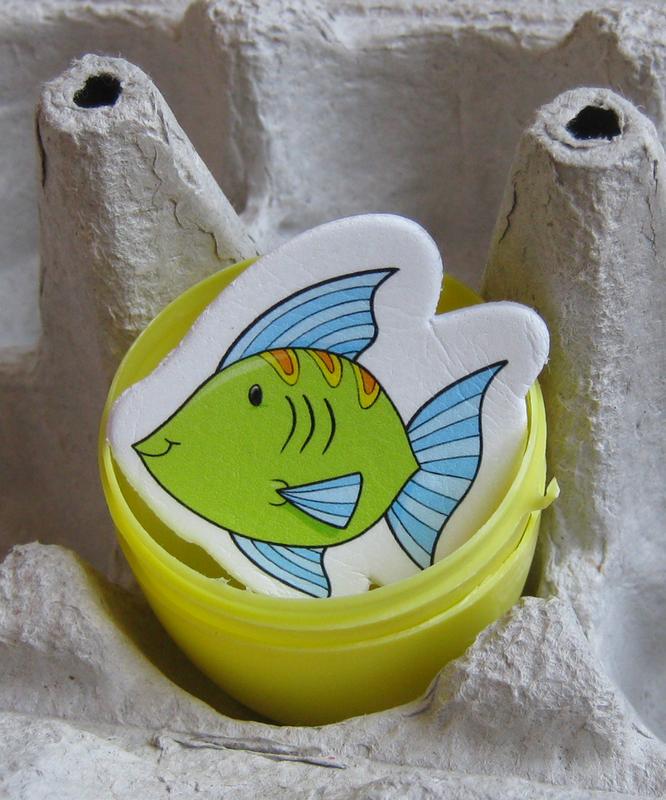 Today’s fish is from a pack of puffy stickers from the dollar store. We said yesterday that Jesus appeared to the disciples. Some people think that Jesus did not really appear. These people think that the disciples just imaged that they saw Jesus, or that they saw a ghost. Remember that the disciples were locked together in a room because they were afraid that the Jews might kill them like they had killed Jesus? While they were in the room, suddenly they saw Jesus standing in the room with them! Wait a minute – the doors were locked! How did Jesus get in there? Can a person walk through a locked door? They were surprised and terrified. They thought they were seeing a ghost. After he said that, he showed them his hands and feet. But they still did not believe it. They were amazed and filled with joy. The disciples were not expecting Jesus to rise from the dead. They didn’t imagine that they saw him and they didn’t see a ghost instead of Jesus. All of them could not have imagined the exact same thing at the exact same time, could they? Tune in tomorrow for Egg #3.